Published February 3, 2011 By Anna T. This post may contain affiliate links. Regardless, I only recommend sites I've researched and/or used and trust. Brainfuse is another tutoring company that hires people to tutor students online. They offer tutoring for third grade up through twelfth grade. Tutoring sessions are available seven days a week. To learn more about the company and what they do, you can visit their website here. 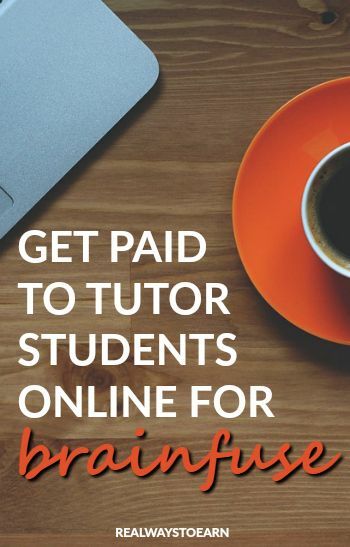 How much does Brainfuse pay their tutors? Brainfuse pays tutors between $10 and $12 hourly, according to Glassdoor anonymous salary reports. How is payment made with Brainfuse? Payments are made through direct deposit to a bank account or mailed check, and tutors are paid every two weeks. What are the requirements to become a Brainfuse tutor? To become a Brainfuse tutor, you must have at least a 4-year college degree. Teaching certification is preferable, but not required. You must also submit to a background check as well as reference checks before you can be hired. You must also have computer with Internet access, preferably high-speed. To work for Brainfuse, you have to send them your resume. If they are interested, they'll email you back with instructions to get started on training. You'll also be asked to send in some paperwork. If you get through their training and are hired, you can begin work. Apparently the training is super minimal — pretty much just some documentation to read before you start. What is involved in tutoring for Brainfuse? From what I can tell, you schedule yourself for preferred shifts to work with students. You are not always working one-on-one — often you will be tutoring more than one student in a single session, which can get confusing and frustrating. There's also something called Instant Access (IA), which is homework help. I think with this you can log on whenever and take students as they log on, looking for tutors, but I may be wrong about this. Info on this job is not very straightforward, unfortunately, so I'm just having to piece things together through the research I've done. As is probably to be expected, the students you tutor are not always nice and friendly. Some Brainfuse tutors report being sworn at online. There is little to no recourse for you when this happens. So it may be helpful to have a bit of a thick skin if you're going to do online academic tutoring for Brainfuse, or any other online tutoring company. Yes, it's very flexible. You are more or less able to create your own schedule, although it times it may be hard to get the hours you want. As you may have guessed, work tends to dry up during summer break and other common academic breaks. So it's probably not wise to depend on this full-time. Does Brainfuse hire tutors outside the United States? No info on this, either. A similar question was asked on the Work at Home Mom forum by someone from Canada, and a lady who trains tutors for Brainfuse wasn't even sure about the answer to this. She advised the person in question to apply anyway and see what happened. If you meet the requirements and are looking for something to do from home with flexibility regarding hours, you might like tutoring for Brainfuse. Again, don't depend on it for your full-time job as you will see little to no work during summer and other academic breaks. If you want to apply to Brainfuse, you can send your resume to jobs@brainfuse.com. If you're looking for more tutoring jobs from home, this is another legit company that is actively looking for online ESL tutors, paying over $14 hourly. Markato, Jaylia, and Writing/History Tutor pretty much explained it all. Last December, I searched and found an ad on Craigslist for Writing Tutors. I applied to it and was told they were no longer hiring for tht position, but they were looking for Live Tutors….big mistake. Once I went through the hiring process and started tutoring, I found that everything Brainfuse had was wrong. The first reason I say this is because I am an English major, E N G L I S H. That means I expect to tutor Writing/Reading subjects. So tell me why the majority of my students are for Algebra 2, Algebra 1, And other various math levels? The second reason is because their lesson plans have severe flaws. I pulled up a few Algebra related plans and found that several of the steps were wrong. I ended up confusing a student because of this. The third reason is the software. I do not know what the problem is but it freezes everything and lags like crazy. I made reports to tech support and nothing was done about it. The only thing I get in the mail are the mistakes I have made while tutoring. Amanda, I am happy you find this company enjoyable but the rest of us do not. $10 dollars an hour to tutor students online is honestly a rip off. Other tutoring companies pay $20-$50 an hour and provide training and REAL evaluations. So instead of wasting my time with this, I’m going to teach college rhetoric and make triple what I would make at Brainfuse. Good luck everyone! I should also warn you guys – if you sign up, prepare to be spammed to death. I was often getting daily e-mails from these people…at some times, as many as 5 e-mails a day (“A tutor recently did X, don’t do that” or “We’re changing this policy, do this from now on.”). Make sure you have your filters set up accordingly. Then again, if they’re constantly switching policies, I guess you’ll want to know about it. They deactivated my account after 6 months of inactivity. Good riddance. If you’re a writing tutor, Demand Studios has finally picked up again. I had other teaching experience, so I was able to get into their Parenting section. Pays $25 an article. I’m almost always able to get at least 10 articles a week. Most weeks, I could probably pick up at least 20. I am working with Brainfuse for the second time around now. I began about 4 years ago doing instant access tutoring late into the evenings, and I had sessions scheduled every night of the week just about and was making very good money just after I stopped classroom teaching and began staying home. Then, they had some business issues from what I could tell, didn’t have the students to schedule tutors (I would sit completely idle during entire 2 hour shifts some nights! ), so they cut EVERYBODIES hours and just wanted you to log in and wait for a ding that there was a student and then you were racing other tutors to answer it and so there was essentially no hours. So after a while of not tutoring, the deactivated me. A few months back I saw posted here that they were looking for chem tutors (before I have checked off so many subjects I didn’t even know what to expect and it was very stressful!). I emailed and asked to reapply and told them I’d worked with them before. Within 2 hours I got a response that they looked up and re-activated my account. They reset all my qualification quizzes and this time I only took chem and bio, so those are my only subjects. I’ve gotten 8 hours a week scheduled so far (two 4 hours shifts…yes they are long and I usually have 2 students at a time). I began at $10/hour tutoring and $7/hour waiting for students like everyone, but a few days ago, I got an email out of the blue praising how a handled a rude student and saying they were upping my pay to $11. =D I still have the option of logging on and trying to pick up extra hours whenever I am available, but just having those set hours with predictable income right now is HUGE as my in person students are in transition between semesters so I’ve lost a few, and the holidays are slow in general. So far, I’m having a much better experience with them the second time around. I worked for Brainfuse exactly one day and was deactivated the next day, because I spent too much time with a student who really needed help. They called that strange. This company doesn’t allow tutors to edit at all and only want you to spend 17 minutes with the student in many cases. They said that it was “strange” to help the student or show them in detail how to improve. I was suppose to say things like “I see no problem” or explain in verb general and vague terms if there was an issues. Example: check your subject-verb agreement. Some students don’t even know what that is. So they deactivate me. I asked the HR guy who hired me and he said that he would check it out, but I said no. Because I knew that they would deactivate the account again without notice, good reason or worse, not even talking to me. Oh, I didn’t receive any training at all. I also tried to contact a monitor – nothing. I looked the word tutor up to make sure I was on the right track in regard to teaching a student. But it seems like Brainfuse has another agenda, especially since they double up on sending 2-6 students to one tutor at a time. In this instance the receive payment for 10 different students, but tutors get paid for tutoring one student. This is a company I refuse to work with again. I was hired but have not done any work for them. I was hired as a writing tutor too. The $12/hr. quote may actually apply to editing papers and not the actual live tutoring sessions, though – I’m not really sure (for example, they may only pay $10/hr. for live tutoring sessions but pay more for ‘reviewing’ papers). In the end, I was just really turned off by their endless rules. I think it’s alarming when you can get deactivated or FIRED if you have ONE TYPO in a chat exchange with a student (I was warned about this). I could see repeated spelling and grammar mistakes, but if it happens once or twice, I’m gone? No thank you. That’s not a company that is worthy of time invested. writingtutor, I think you’re right to be upset about the company, and I have many of the same complaints (and I’ve not even done any actual work for them). For a while, I was constantly getting e-mails citing little mistakes people made and what not to do as a tutor. If you are handling multitudes of students at once (and according to policy, you can’t tell students this), you should be paid accordingly. Otherwise, what incentive do I have if I’m going to be paid the same…regardless of whether or not I’m tutoring one student or four? This is an extreme last resort for me as far as work goes. I primarily work for transcription, search engine evaluation and writing/blogging sites. I see Brainfuse as a launchpad on the resume for much better tutoring sites. tl;dr version – don’t waste your time applying. This company is good for what it is if you stay with it but they will fire you without letting you know if you make a slip up (this usually involves their policy-related stuff). I made an error and misquoted their policy to a student, worked for a month, then suddenly stopped getting students even though the original warning was only that – a warning, not a dismissal. After 3 weeks I finally received a response reactivating me and stating to not do it again. Few months later, with 0 negative feedbacks to my name since the incident due to extra care, I’m suddenly deactivated and then erased. After a bunch of emails I get a one line response simply stating they do not deal with tutors from California anymore. Since my account is deleted I have no idea if my payroll is going to go through. I’m also not in California anymore (only my payroll account is), but a week after I emailed them this info, I’ve yet to receive any response. Overall, their customer support is simply non existent if you have a problem as a tutor. Their policy even explicitly states to not call their number unless 10+ days have passed and the matter is only payroll related. Aside from all these problems, there is another thing they do not mention until you’re hired. You will have to tutor 2-4 students at once. During the school year 2 students was 95% of my tutoring experience. During really busy days you will get 3. And I’ve seen up to 4 several times. You are allowed to contact the supervisors to transfer the “overflow” students but the usual response is “no transfer is available.” And since one of their policies involves prompt responses and inability to tell other students you’re teaching other students at the same time, you basically have to read 5-10 page papers from 2-3 students at a time, responding to a variety of comments that are often disconnected. And if you get a student who wants an immediate response (i.e. after 2 seconds of waiting they will haunt you), you’re basically left with doing really poor work for the other student(s). On top of all this, for better or worse, they don’t actually care how you help the students. I’ve even had a supervisor tell me this (his words were.. especially as long as you help them a little that’s enough). In other words, as a professional ex-teacher who actually knows composition writing, I have had countless students tell me I have contradicted everything they’ve been told by other tutors. I’m sad to say that once I realized how this functions, unless I’m only tutoring one student, I basically end up doing really poor work on purpose because I know that that’s the norm and I can get away with it. I do want to help the students but their system disallows it. p.s. in case you haven’t figured this out by now.. no they do not pay you more if you tutor more than 1 student. And the 12/hour fee that is mentioned in one of their documents is not true. Everyone gets 10. 10/hour to tutor 2-3 students. You brain explodes after about 3 hours. I applied for this. I haven’t signed an NDA. But apparently they pay writing tutors $10 – $12 an hour. It sounds like if you’re a writing tutor, you can either just review documents that people have already loaded…or enter a live session to answer student questions. They send you a 20-page document outlining their procedures. I have to admit, I’m a little intimidated by all of the procedure involved in an online session. That makes me fearful. But I’m going through with it anyway. I hope I get hired. Although…that’s a very minor complaint. For what it’s worth, I don’t have any tutoring experience. However, I do have years of substitute teaching experience. Hello again, Anna. All is well in Week 3. I have not picked up hours beyond the 21 on my schedule because of IRL work (hooray! ), but they are certainly available. Thanks again and I will keep you informed. Thank you for the update and congrats on finding more work!! That’s good to hear about the tutor’s group. It’s great to have something like that where people who work for the same company can converse, share experiences, tips, etc. Congrats, and I wish you continued success with Brainfuse!!! Of note to anyone reading this for Brainfuse information–at present (October 2011) they are actively recruiting tutors in Chemistry and Organic Chemistry (high school first year, high school AP, and first-year college level). Send your resume to jobs@brainfuse.com with “Chemistry: Immediate Hire” in the subject line. For best results, attach a resume AND an unofficial transcript showing your chemistry grades. They got back to me the same day–I have a lot of tutoring experience and solid grades, but not straight As by any means. The pay is slightly more than posted above. One signs a nondisclosure agreement, so I can’t be too specific. This part is the key. You can’t wait for them to assign you a student or a help desk-type time slot. Whenever it is you’re free to work, log on to their client application. When a student logs on, a dialog will come up asking if you’re available to tutor. Click OK and there you have it. In this way I have gotten as many hours as I can handle. Good luck! So far I find it to be decent, respectable work–and it’s possible to see the students actually learn something. I have been pleasantly surprised by the amount of education it’s possible to “get across.” Ironically, although an experienced teacher or tutor can make a lot more tutoring IRL, I recommend this specifically for people with YEARS of teaching/tutoring experience who need to work at home for whatever reason. It is very challenging to provide good explanations online–you have to know the material cold and be totally fluent in how to put it so the student can understand. It’s actually something of a meditative experience, and I’m not joking–to do a quality job that you can be proud of, you really have to look inside yourself for the purest and most concise explanation. Thank you so much for sharing this extremely helpful info! I will go share on my FB fan page that they actively recruiting in that subject area. And thank YOU for this very helpful site–a nice break from all the spam. Your reviews pushed me to apply for this and a couple of other online jobs…it’s opening up an actual revenue stream. Good show! Yay! I am always happy to hear that 🙂 Congrats on the revenue stream! Update: less than a week after I started, I am now on the schedule for 21 hours per week. They would likely have given me more than 21 if my schedule had permitted. This is *in addition to* the basically unlimited hours one can get on an on-call basis (as I describe at the post at the beginning of this thread). IMPORTANT NOTE: my experience is probably not typical, as I was hired in a high-demand subject and have many years of tutoring experience. But I will state for the record that this is putting food on the table. If I had believed it was legitimate, not just “not a scam,” but LEGIT legit, I would have applied months ago. Thank you to Anna and the other commenters on this site!